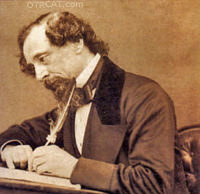 "Mayor of the Town: Christmas Carol"
Charles Dickens is considered one of the greatest English Language writers. Written in Victorian England, his much of his writing looked into themes of social injustice including child labor, sanitation, and poverty. There are numerous memorable characters that color his stories, such as Ebenezer Scrooge ("Bah! Humbug! "), David Copperfield, Oliver Twist ("Please, sir, I want some more. "), Charles Darnay, and the wicked and bizarre Miss Havisham, among many others. 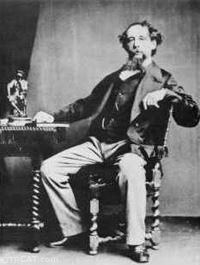 Born on February 7th, 1812 in Landport in Hampshire, Charles Dickens was the second of eight children born to Navy clerk John Dickens and Elizabeth Barrow Dickens. The Dickens family relocated to Chatham, Kent when the young Charles was 5 years old. He spend most of his boyhood exploring the outdoors and reading. As Charles was enjoying a carefree childhood, John Dickens debts grew to maintain their social position and he was subsequently imprisoned in a debtor’s prison. This caused 12 year old Charles Dickens to go to work to help support his large family. Working in a factory, he was greatly moved by the worker’s poor conditions and lack of rights. Though his family’s financial situation improved, Dickens remained moved by injustice and a strong distaste for the super rich and lawyers. Throughout his life, his journalism and novels reflected his shocked impression of the poor’s suffering. This collection includes is a diverse assortment of shows including Burns and Allen, Escape, Suspense, Lux Radio Theater, Richard Diamond, and many more. Charles Dickens’ work has remain popular and none of Charles Dickens’ writings have gone out of print and there are many Charles Dickens Festivals around the English-speaking world. I just found your web site and plan to purchase some of your MP3 disks soon. Most of my purchases are for my own listening pleasure and I put up with whatever audio quality I get. However, I also teach an Old Time Radio class at an "Old Folks Home." The challenge is, these folks don't hear as well as they used to, so I sometimes strike out playing a show that happens to be of a poorer sound quality and they can't understand it. Great variety of programs here. All are excellent. Excellent variety of programming with their take on the Charles Dickens 'Christmas Carol'.